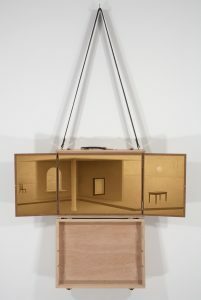 Jeffrey Abt, Wandering Gallery project (workspace) open, 2013. 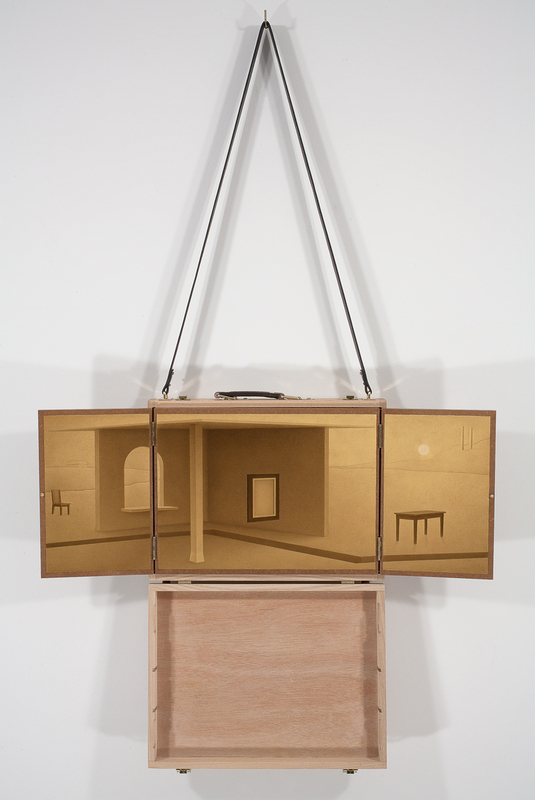 Jeffrey Abt, Wandering Gallery project (workspace) closed, 2013. Jeffrey Abt will present an artist’s talk on his work “Museums as Viewing Machines”, on view in the Ridderhof Martin Gallery from September 6 – October 14. Abt’s work reflects his interest in museums, the mechanics of presenting work in a museum, and the visual culture of museums. 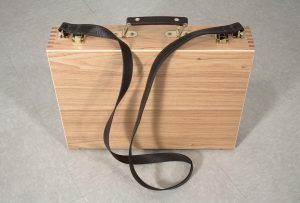 “Museums as Viewing Machines” will display two bodies of work, Abt’s Museum series, and his Wandering Gallery project. The Museum series focuses on the visual parallels between galleries and sacred spaces, particularly religious sanctuaries. Abt is intrigued by environments created to foster contemplation, whether for the purposes of studying artworks or for spiritual introspection. The Wandering Gallery project explores the behind-the-scenes, never-ending cycle of unpacking and packing, installation and de-installation, documentation, and interpretation associated with changing exhibitions. These works, in proximity, invite viewers to reflect on the nature of the places where they see works of art, especially museums, with regard to their architectural interiors, as sites of transience where objects come and go, and the mechanics by which works are presented. Jeffrey Abt is a Professor in the James Pearson Duffy Department of Art and Art History of Wayne State University. He has a BFA degree from Drake University and he studied at the Hebrew Union College-Jewish Institute of Religion in Jerusalem before completing an MFA at Drake. Abt pursued curatorial and exhibitions work at the Wichita Art Museum, the Special Collections Research Center of the University of Chicago, and the University’s Smart Museum of Art, before coming to Wayne State. He’s an artist and writer, his artwork is in museum and corporate collections throughout the United States, and he has exhibited in solo and group exhibitions in America and abroad. Abt’s writings include the books American Egyptologist: The Life of James Henry Breasted and the Creation of His Oriental Institute published in 2012 by the University of Chicago Press and Valuing Detroit’s Art Museum: A History of Fiscal Abandonment and Rescue published by Palgrave Macmillan in 2017. He is also a co-editor of the Museum History Journal.